The confrontation with Astra's forces ends with Astra captured by the DEO... and Henshaw captured by the alien criminals. 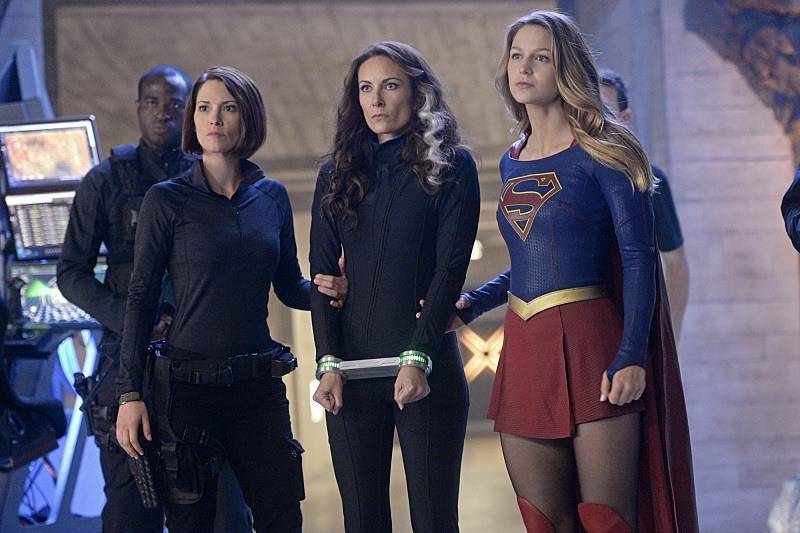 Now, as Alex contends with General Lane's attempted coup and James begins investigating Max Lord's operations, Kara must cope with Cat Grant's discovery of her secret identity! The Supergirl run of Sterling Gates (Cat Grant trying to figure out Supergirl's secret identity, Sam Lane as a xenophobe) The Day The Earth Stood Still (name-dropped by General Lane as the reason he fears aliens) New Krypton (the idea of Kryptonians trying to save the Earth by imposing their will on it) and countless Silver Age comics where one superhero disguises themselves as another hero so that said hero and their secret identity can appear in the same place at the same time. Cat Grant does a complete 180 from the end of the previous episode, having gone from seeming genuinely grateful for Kara's help to being one step away from exposing her secret identity to the world for the sake of a story or firing her because she can't believe that Supergirl can have/should want a life outside of continually saving the world. It completely undoes all of the character development in the previous episode! The special effects when Kara shields Alex from the bomb are well handled. The room James tries (and fails) to break into at Maxwell Lord's lab is Room 52. The number 52 has a special significance in the DC Comics Universe, which is more fully explained here. In brief, references to the number 52 are hidden through various DCTVU series as an in-joke. There is a long tradition in classic DC Comics - particularly in Superman comics - of superheroes helping each other out with hiding their secret identities. Most frequently this happened with Batman using his talent for disguise to pose as Clark Kent or Superman using his talent for mimicking voices to impersonate Batman, after donning his costume. General Lane makes use of some sort of Kryptonite-based liquid to try and get information from General Astra. It is not identified as a truth serum but it causes great pain in any Kryptonian it is injected into. Room 52 of Maxwell Lord's research lab is fitted with a bio-diagnostic system rather than a keypad, finger print, voice print or retinal scanner. This makes it totally unhackable, at least by Winn. Henshaw: Director Danvers. Congratulations on your promotion. Maxwell Lord: I know who your friends are. And I find your association with them rather troubling. Especially considering your prominent role in the media. James: Well, the media doesn't exist to make people like you feel comfortable, Max. Astra: They sent you back to try again? What makes you think it will be any different this time? Kara: Because now I'm ready to hear what you have to say. I was afraid to listen before. But today, I got so upset I couldn't think. I didn't want to. I just wanted to hurt someone. Because I was afraid of losing everything that mattered to me. Like you must have felt back home. But if we have any hope for the future, we - we can't let our fear control us. We have to be better! Astra: You give me too much credit. Kara: Because I know the real you. Astra: The woman you knew died on Krypton. Kara: I still have faith there is good in you. Astra: I am not worth your faith. Kara: Everyone deserves faith, Astra. Even you. Alura: I believe you. I believe Krypton faces annihilation. And far sooner than anyone here will admit. Astra: Then why condemn me? Alura: Because you killed people, Astra! No matter what noble goals you hid behind, nothing will ever change that fact! And I am bound by more than blood in this court. But I promise you I will fight for your cause. Not through fear and manipulation but through compassion and reason! It is the only hope to save our world. Astra: Do not mistake my compassion for weakness. This is not a truce. Supergirl: Then let's call it a start. Kara: (To "Henshaw") So... what did Alex mean when she said you had to transform? Or did you forget that I have super-hearing? Kara: But... why stay hidden?! J'onn: I'm trying to make the world a safe place for everyone. Human and aliens alike. I failed Alex's father before I assumed the identity of Hank Henshaw. I won't fail again. Alex: And you saw what the DEO was like under General Lane, so we need Hank... J'onn... at the top. Kara: You know, you guys could have told me! I can keep a secret! J'onn & Alex: (in unison) No, you can't. Every damn bit of Cat Grant's attempts to get Kara to admit she is Supergirl. Thank goodness this won't be a regular thing. Maxwell Lord refuses any further help from Alex Danvers. The DEO Line of Succession is classified. Alex is to take over as Acting Director if anything happens to him. "Blood Bonds Us All" is a Kryptonian proverb dating back to the days when the Kryptonians were little more than waring clans. Alex's favorite food truck is in Chicago. One of the alien criminals was part of a race famous for their telepathic powers. However, it is not as strong as Martian telepathy and Non kills the alien before we learn his name or species. According to Astra, Allura promised to work to save Krypton while condemning her violent methods of achieving the same ends, affirming Kara's belief in her mother's idealism. Kara now knows that Hank Henshaw is J'onn J'onzz of Mars. Cat no longer believes Kara is Supergirl. It is confirmed that Martians have the power of flight. Maxwell Lord procured a Jane Doe with no relatives or connections of any kind. He is conductiing some kind of experiment on her using the severed arm of The Red Tornado from 106. All the character development from last week which made Cat a likable, intelligent character is completely undone with the random decision that she cannot be trusted with Kara's secret identity and the revelation that she is so blisteringly thick as to not figure out the secret. Dreadful for the first 40 minutes, as Cat Grant and General Lane vie for the title of most patently idiotic cartoon super-villain ever... which shouldn't even be possible in an episode with Maxwell Lord in it! Redeemed only by the strength of Melissa Benoist's performance in the final sections and the fact that the bits with Martian Manhunter are awesome. I agree with J'onn - it's a shame that Kara can't work for the DEO full time because the scenes at CatCo are dragging down the rest of the show.